PHNOM PEHN, Cambodia — An Australian filmmaker was awaiting deportation from Cambodia on Saturday after receiving a royal pardon for his conviction on spying charges for flying a drone over a political rally. 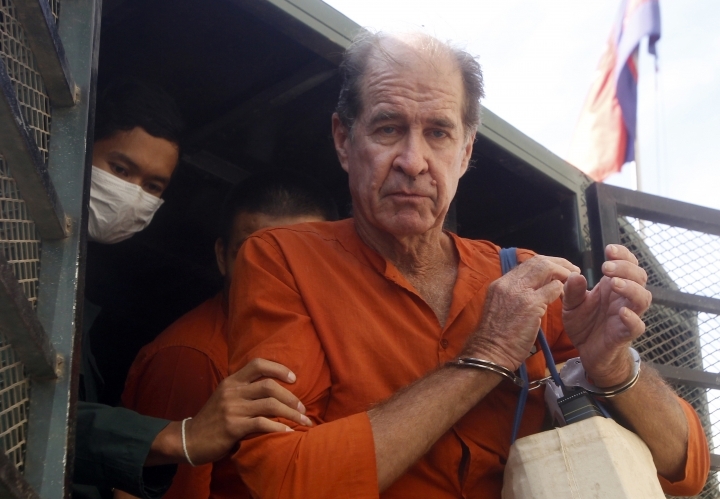 A spokesman for immigration police said that James Ricketson will be deported on Saturday morning, a day after being released from prison. "We are now checking a flight for him," Gen. Keo Vanthan told The Associated Press. Ricketson, 69, was sentenced to six years in a trial his sympathizers described as farcical because prosecutors never specified whom he was spying for and failed to present evidence that he possessed or transmitted any secrets. He had been detained without bail since June last year in harsh conditions. He was arrested after flying a drone to photograph a rally of the Cambodian National Rescue Party — the only credible opposition party that was later dissolved by the courts at the instigation of Prime Minister Hun Sen's government. His pardon is the latest in a series of releases of political prisoners after the ruling party's landslide victory in a July election that critics and observers said was deeply flawed. Ricketson repeatedly insisted he had no political agenda and his work making documentary films was journalistic in nature. His Aug. 31 conviction was met with only lukewarm public concern from Australia's prime minister and foreign minister. Their public stance was criticized, but also led to speculation that an understanding might have been reached with Cambodian authorities for Ricketson's early release. Ricketson's lawyer, Kong Sam Onn, said Friday that his client would go first to Phnom Penh and then travel to Australia. "James will go back to his home country after he is released, but later he will be back to Cambodia because the pardon letter doesn't bar him from re-entering Cambodia," he said. However, there is no official statement guaranteeing he will be readmitted. Ricketson had said during his trial that he wished to re-establish a project that he had launched before his arrest to buy some land to resettle several poor Cambodian families who have been living at a garbage dump. He and several character witnesses had testified that he provided financial assistance to several poverty stricken Cambodians.